Birds are among the most beautiful of creatures, with an infinite variety in sizes, shapes and colors. They truly capture the artist’s imagination and inspire creativity. Beginning with the basics of standard bird anatomy, this workshop will cover various avian features, including their unique characteristics and distinguishing traits. Drawing both form and detail, we’ll compare types, coloration and adaptations that allow them to survive and flourish and consider how to create a composition that helps the viewer learn more about them. We’ll use taxidermy specimens, photographs, video and live observation and work in graphite and watercolor. 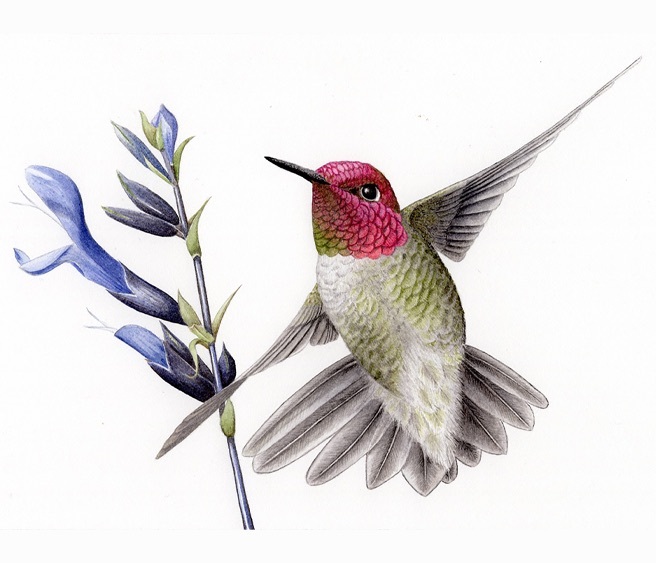 Nora Sherwood has a professional certificate in Natural Science Illustration from the University of Washington and is a working artist on the Oregon coast. Her science illustration work is guided by Baba Dioum's famous quote: "In the end we will conserve only what we love; we will love only what we understand; and we will understand only what we have been taught." In addition to commissioned work for scientific journals, Nora shows work in galleries around the Pacific Northwest, and teaches workshops. on hand when I'm sketching - F, 2B and 4B is a useful set).